Meryl Streep and Christine Baranski entertained the audience that attended the Public Theater Gala 2016 in the East Village section of lower Manhattan. The performers did a unique version of “Brush Up Your Shakespeare” which is a fragment of a larger musical called “Kiss Me, Kate” by the famous Californian composer Cole Porter. However, the surprise was their dress selection. 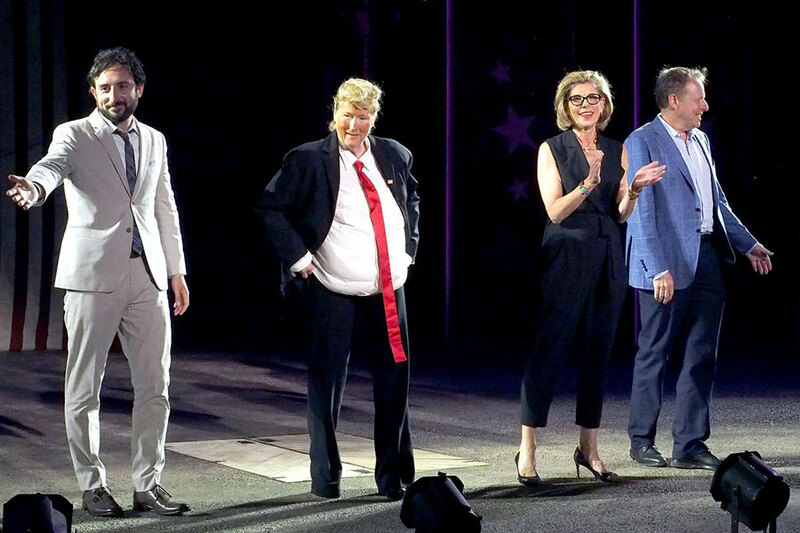 Streep came to the scenario dressed like Donald Trump, and Baranski joined her impersonating the Democrat candidate Hillary Clinton last Monday. “You’ll let me know why it is all the women say no,” she sang at the performance. The Public Theater is an arts organization based in New York City. First known as The Shakespeare Workshop, Joseph Papp founded it in 1954. The objective was to give upcoming artists the opportunity to show their skills, and audiences, the chance to enjoy new and fresh material every year. After Papp died in 1991, the Public Theater was named “Joseph Papp Public Theater” in his honor. Every year, theater fans and people who want to see something different attend one of the five theater venues: the Shiva, the Martinson, the LuEsther Hall, the Anspacher and the Newman all close to Joe’s Pub, which is a cabaret-like setting used by local performers. This year, people attending the show got a deal by seeing the very famous actresses Meryl Streep and Christine Baranski in one of their most rare roles. Streep impersonated Republican candidate Donald Trump and Christine, Leonard’s mom in the Big Bang Theory series, did the same with Hillary Clinton. They modified a very famous play to incorporate satirical elements and sang their way through the evening. Everybody seemed to enjoy the parody including the performers. As unique and entertaining as it was, the act adds to the long list of satirical criticism the candidates have received this year, especially Mr. Trump. To be fair, he has given comedians enough material to build a career. For example, Last Week Tonight has featured the Republican candidate and his proposals. He made an entire segment to analyze the proposed wall between the United States and Mexico, a couple of times, and Jimmy Kimmel hosted in his show Josh Groban singing a list of Donald Trump’s most hilarious tweets. Statements like “Sorry losers and haters, but my I.Q. is one of the highest- and you all know it! Please don’t feel so stupid or insecure, it’s not your fault”. It is not rare to see a political parody, especially in election season. Everybody talks about it, and every candidate, no matter how virtuous, will say something weird. However, the current race for the big chair at the White House has been heavily criticized by both national and international communities, and sometimes, performers hit the nail by saying in public what everybody around the world is thinking.